The talented offensive lineman used his considerable skills in the classroom to study the best offensive lineman to learn and add their techniques to his own. 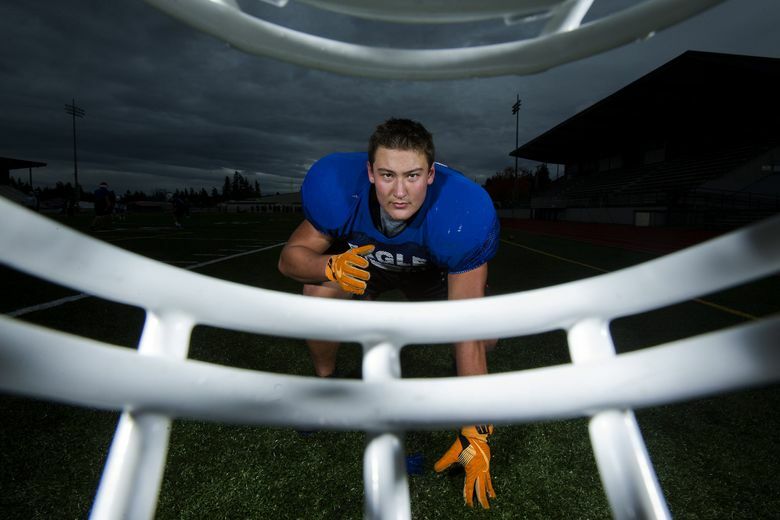 SPANAWAY — Taking cover in a downpour, Foster Sarell gazed at Bethel High’s football field from its metal bleachers as if it were a fairway at Augusta National. Stand next to Sarell, and it’s immediately apparent what sport he’s built to play. Massive like a Douglas fir, Sarell is imposing in football pads and helmet. Follow along: For up-to-minute updates on playoff games, use hashtags #wafbscores or follow @SeaTimesPreps on Twitter. Top story lines: Archbishop Murphy says it’s primed for a deep Class 2A postseason run despite enduring five forfeits from conference opponents. 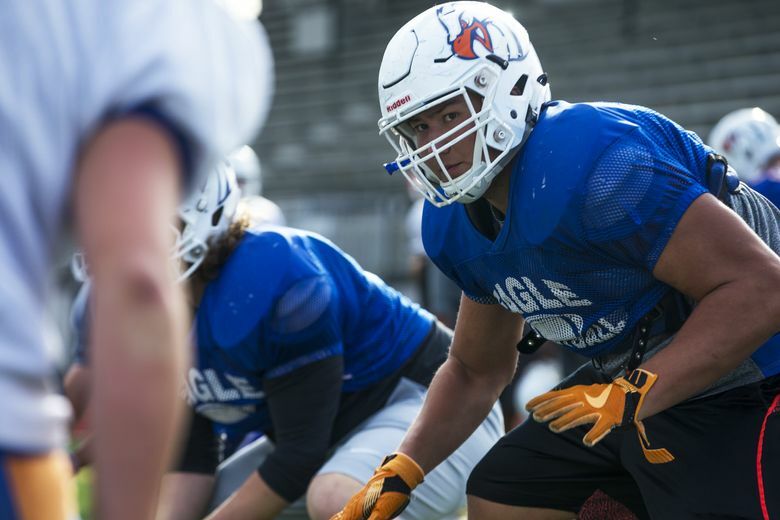 ... Eastside Catholic aims for a third straight Class 3A title with Bellevue out of contention due to postseason ban. ... Sammamish is vying for Class 2A state berth after forfeiting five games last season due to injuries. ... Gonzaga Prep, the defending Class 4A state champion, is on a seven-game win streak. ... Tumwater coach Sid Otton, the state’s all-time winningest coach, retiring at end of season. Top players: OL/DL Foster Sarell, 6-6, 315, Graham-Kapowsin; RB/DB Connor Wedington, 6-1, 195, Sumner; RB/DB Collin Montez, 6-1, 200, Archbishop Murphy; OT/DT Henry Bainivalu, 6-6, 290, Skyline; DE/TE Cade Otton, 6-5, 225, Tumwater. Favorites: Camas (Class 4A) Woodinville (Class 4A), Richland (Class 4A), Eastside Catholic (Class 3A), Bonney Lake (Class 3A), Lynden (Class 2A), King’s (Class 1A). Last: Does the computer know best? The Maxpreps.com computer rankings has two teams from Washington, Camas (No. 12) and Sumner (No. 22), in its West Region Top 25. His 6-foot-6, 315-pound frame makes Sarell stand out. His technical skill as a lineman has grabbed national attention. And this week, the Graham-Kapowsin senior will blend both in a final run for a Class 4A state title come December. No. 6 Graham-Kapowsin (8-1) hosts Kentlake (7-2) on Friday at 7:30 p.m. in the state preliminary round. Sarell’s football career began in tears. The Graham native was a plump third-grader reporting to the first day of youth football camp. He rushed to coach Eric Kurle, who’s known Sarell since age 4, and said he wanted to play quarterback. Sarell found football fun as a youth, yet it took time to develop a passion. A tight pack of about 10 kids, including Kurle’s son Ian, associated seasons by what sport they were playing. The year began with basketball then came baseball, summers on the golf course or playing pickleball at the Sarell family home, and football rounded out the calendar. Basketball was Sarell’s first love. He was unyielding as a power forward through middle school and worked hard in practices, mastering Fred Astaire-like footwork despite his size-18 feet. 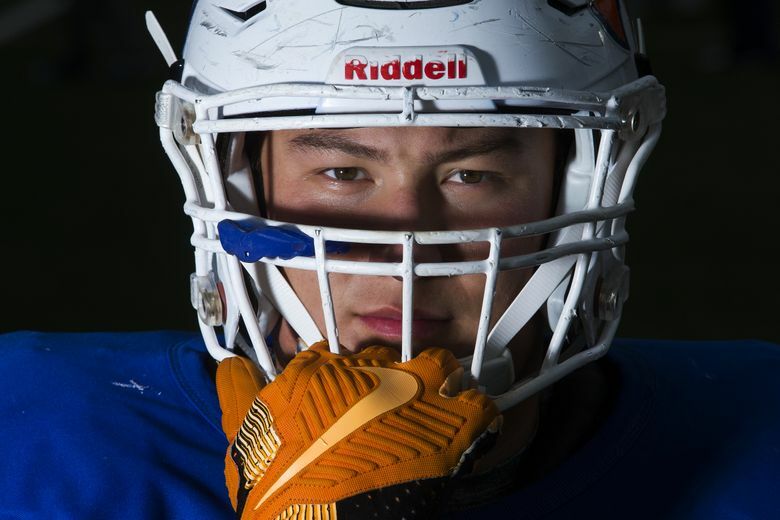 Sarell was nimble and strong — as a freshman he wowed onlookers by bench-pressing 185 pounds 35 times in a strength competition — and he could see those traits would be his biggest assets on the football field. Foster, 18, can rattle off linemen and their particular skills like a general manager prepared for a draft. Throwbacks such as NFL Hall of Famers Anthony Munoz, Walter Jones and Orlando Pace. Modern-day players such as Joe Thomas (Cleveland Browns), Laremy Tunsil (Miami Dolphins) and Trent Williams (Washington Redskins). Nearby players like GK assistant coach Cameron Brophy, who played at Eastern Oregon, and LeCharles Bentley, a former NFL standout who runs a lineman academy. Sarell credits basketball for his quick feet on the football field. Combine it with his strength, hands and ease in and out of his stance, and that’s how Sarell won the MVP award for offensive linemen at Nike’s The Opening camp in July. The honor confirmed Sarell as the top recruit in the state, according to multiple sites. ESPN and Scout.com have him among their top five in the nation by position. UW coach Chris Petersen has Sarell as a prime prospect, even heading to a game via helicopter due to a tight schedule. Sarell is undecided, narrowing his college list to Stanford, Washington, Notre Dame, Nebraska and Alabama. He hopes to have a decision made by December. What the institutions offer academically slightly outweighs the football program. Sarell is planning a degree in finance. He boasts about having seen “The Big Short” 10 times and counting. Although Sarell has plenty of accolades, his team hasn’t won a state title. Sarell missed nine weeks of his junior season due to a dislocated bone in his right arm. Graham-Kapowsin lost 49-14 to Lake Stevens in the state quarterfinals. The Eagles reached the semifinals his sophomore season. This year, GK has a standout junior running back in Micah Smith, who Sarell and the line helped total 1,600 yards and 24 touchdowns. For the state run, Kurle said he’ll use Sarell on both sides of the ball in an effort to get to the Tacoma Dome for the state title game.